The dust is finally settled and Chelsea now have a supposed proven striker in Argentine forward, Gonzalo Higuain. Throughout Chelsea’s sound defeat to Arsenal in the haze of the Emirates Stadium on Saturday, every touch from the blue half of London brought out talks of the incoming striker from the microphones of the veteran, yet retiring ace commentators, Jim Beglin and John Champion; outsiders to the game would have thought the former Real Madrid striker would be standing in goal and scoring upfront at the same time, question is, does Higuain’s loan signing offer any good to the striking problems of the Blues? Eden Hazard will gladly welcome the development, anything to stop deploying him up front will come good for the sleek Belgian but where does this leave Olivier Giroud? Alvaro Morata is on his way to Atletico Madrid also on loan, ending what must be another of the odd stories of the strikers Chelsea have hired in recent times; while the strange situations of Diego Costa would haunt the team for long and they’d wish they never sold him, a seemingly unlucky Higuain will blow hot and cold, and with him being handed the same jersey number 9 that Morata dropped after a turbulent season, it’s up to him to live up to the hype or fall off like his predecessors. How will Chelsea line up with him? They stay on the 4-3-3 with two wide men, where one of them will definitely be Eden Hazard and the other would be between the trio of Willian, Pedro and the talented Hudson-odoi. 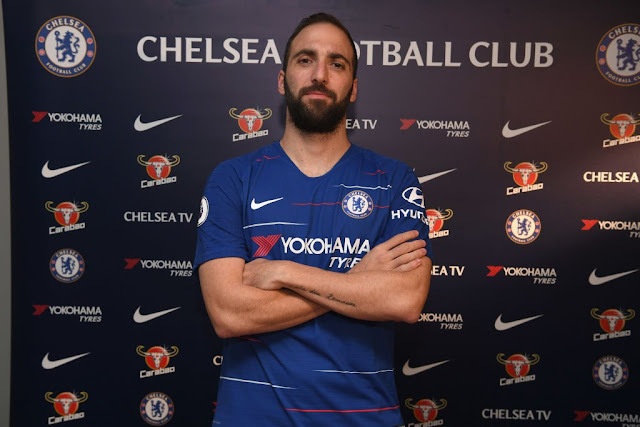 Whatever happens, Gonzalo Higuain won’t offer better results than what Chelsea got impatient with, he even has fewer goals than Morata at this stage and most definitely become fans worst enemy before you pronounce his name in full. Arsenal will line up against Manchester United on Friday in the Emirates FA Cup without hector Bellerin who was announced to be out for the rest of the season following a mishap in Arsenal’s 2:0 success over Chelsea last weekend. The fleet-footed right-back was stretchered off after 70minutes and won’t be returning to the pitch until next season; Arsenal are now condemned to fielding either of 35year old Stephan Lichsteiner and Ains Maintland-Niles for the rest of the season, of course except they opt to do businesses in the soon to be closed transfer window. Manchester United are playing their best football since Sir Alex Ferguson left, and even at their worst, they always find a way to beat Arsenal, so what odds favour the Gunners in this fixture and in games to come? With injuries hitting hard on Unai Emery’s side, one would wonder if Arsene Wenger’s ghosts are still very much around, that said, anyone that saw them being subdued by Westham a fortnight ago wouldn’t believe it was the same team that took Chelsea to the cleaners at the Emirates on Saturday, such inconsistency is the reason they aren’t on top of their game. Priorities may rule the day in this, they will want to push further in the Europa League, they really might not need another distraction in the mould of the FA Cup, straight win united? Cardiff will follow them, harsh on the efforts of the bullish Neil Warnock, but hey, it is what it is and you can’t give what you don’t have; the highest goal scorer in the Cardiff squad is a midfielder with four goals, and quite unfortunate to hear of the fate of their new signing, Sala from Nantes who hadn’t kicked a ball before being declared missing on a plane, slim chances of survival bit certainly, most certainly, the hangover will haunt them down to the championship.